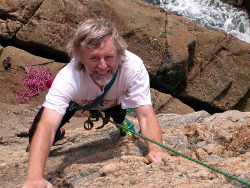 Steve Berry is well known to our audience as one of the founders of Wilderness Lectures. Born in Shillong, India, just south of the Bhutanese border, Steve has returned to the Himalaya many times as leader of remote treks and expeditions. These include the first British ascent of Nun, 7,135m/23,410ft., in Kashmir and attempts on the sixth highest mountain in the world, Cho Oyu, 8,201m/29,906ft., in Nepal, and also Gangkar Punsum in Bhutan, 7,550m/24,770ft. He is the owner of Mountain Kingdoms Ltd (formerly Himalayan Kingdoms), a company offering walking holidays worldwide. Steve has climbed, trekked and explored all over the world but his passion is the Himalaya. He has completed 60 or 70 treks in Bhutan, Nepal, Tibet, Pakistan and various parts of the Indian Himayala. He is also the first British person to complete the highly auspicious Inner kora of the holiest mountain in Asia, Mount Kailash in Tibet. He also made the first official ascent of the highest mountain in Outer Mongolia, and has twice trekked up the frozen Zanskar river in Ladakh in mid winter. Steve has something of an obsession with Bhutan's highest mountain, Gangkar Punsum 7,550m/14,770ft. In 1986 he took a mainly Bristol based expedition to attempt the first ascent. The expedition failed when an early winter jet-stream basically blew the expedition off the mountain. There were all kinds of adventures, and it was undoubtedly a turning point in his life. It resulted in Steve setting up an adventure travel company which is still his passion 30 years on. In that intervening time he has taken six more groups to visit the highest unclimbed peak in the world, and to explore both the western and eastern sides of the peak. In 2014 he was trying to find a route from east to west and standing on a col at 5,426m/17,800ft his trusty Bhutanese Guide, Karma Tenzing, spotted a strange set of tracks high on the adjoining mountainside. In 2015 he returned to the same spot and a mile or so down the valley found more unexplainable tracks. Steve's talk is about these findings and he will relate a little of what has happened since. The mountain remains unclimbed and in fact the Bhutanese authorities have now closed their kingdom to all mountaineering expeditions. Steve will also describe Bhutanese beliefs in relation to the Yeti, and the creature's place in their rich folklore. Hi, thought this Lecture may be of interest http://www.wildernesslectures.com/speaker.php?id=227 ----------------------------- Steve has something of an obsession with Bhutan's highest mountain, Gangkar Punsum 7,550m/14,770ft. In 1986 he took a mainly Bristol based expedition to attempt the first ascent. The expedition failed when an early winter jet-stream basically blew the expedition off the mountain. There were all kinds of adventures, and it was undoubtedly a turning point in his life. It resulted in Steve setting up an adventure travel company which is still his passion 30 years on. In that intervening time he has taken six more groups to visit the highest unclimbed peak in the world, and to explore both the western and eastern sides of the peak. 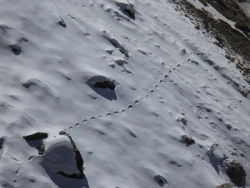 In 2014 he was trying to find a route from east to west and standing on a col at 5,426m/17,800ft his trusty Bhutanese Guide, Karma Tenzing, spotted a strange set of tracks high on the adjoining mountainside. In 2015 he returned to the same spot and a mile or so down the valley found more unexplainable tracks. Steve's talk is about these findings and he will relate a little of what has happened since. The mountain remains unclimbed and in fact the Bhutanese authorities have now closed their kingdom to all mountaineering expeditions. Steve will also describe Bhutanese beliefs in relation to the Yeti, and the creature's place in their rich folklore.